Double Chocolate Whiskey Cake with Whiskey Ganache! – Whiskey and Chocolate you were made to be BFF’s! Who loves booze and chocolate? Raise your forks! I have found it…the best cake in the world! It’s got chocolate, it’s got whiskey, it’s got more chocolate! It will make your kitchen smell like a distillery! (I mean that in the best possible way). I used my Best Choclolate Cake recipe and just tweaked it a bit. I reduced the baking powder to give it a more dense cake texture. I added additional chocolate chips to the batter and of course the booze! 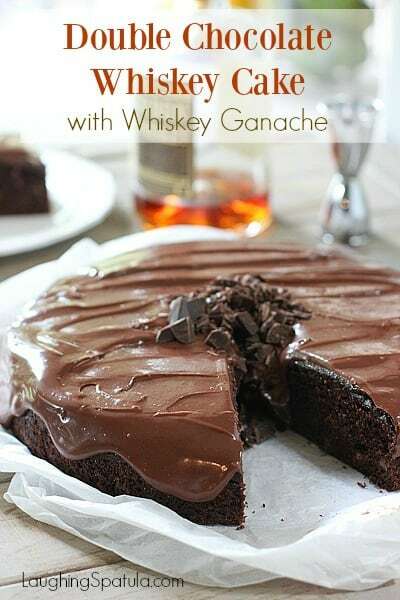 Tips to make to make this Chocolate Whiskey Cake with Whiskey Ganache! Cake: Use good chocolate and cocoa! I made this for my BFF in Palm Springs last week. I was in a hurry and used an off brand of cocoa and chocolate chips (Trader Joes). It was a DISASTER! Sorry dear Raela and Bob, I made you a broken cake…what good is a BFF that has a food blog if she can’t make you a decent cake? Now the good news is, your chocolate and cocoa doesnt have to be some high end unavailable stuff. Ghiradelli is my first choice but I have made this cake with Nestle Semi-Sweet chocolate chips, and it was fabulous. I used Hersheys Unsweetened Cocoa ,which is in most of our cupboards already. Just saying, don’t buy the cheap-o stuff. Whiskey: I am no whiskey officiando. 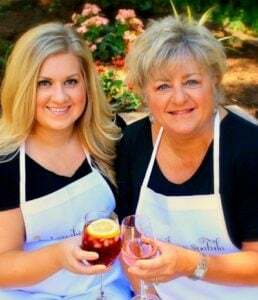 I can talk wine all day long but don’t ask me to explain the difference between whiskey and bourbon. But what I do know is that, for this recipe, you need a full flavored whiskey-bourbon. Something like Jack Daniels. A nice Kentucky mash would work as well. I used Woodinville Whiskey. A distiller right outside of Seattle. Avoid the Canadian blends like Crown Royal. The flavor won’t hold up while baking. You will need a total of 4.5 ounces. You might consider buying those little bottles we call ‘spark plugs’ around here. They are great for recipes and other stuff…:). Ganache: Ganache is equal parts cream and chocolate. Thats it. It sounds sooooo fancy but it’s remarkably easy to make. I make my ganache in the microwave. Doesn’t get much easier. Warm up the chocolate, heat the cream to almost a boil. Pour hot cream over chocolate, mix and you got a fancy schmancy chocolate topping for just about everything. Make the ganache first and chill while the cake is baking. This will thicken it up so it’s the consistency in the photo below. Yum. This recipe will work in a 10″ spring form pan or a 9 x 13 inch cake pan. I like this cake best when made a day ahead but not essential. Just make sure it’s cool before you frost it. Looking for a more family friendly chocolate cake? Got ya covered here! Best Chocolate and Peanut Butter Cake! Best Chocolate Cake! One bowl easy and comes with a recipe for an 8 x 8 or 9 x 13 pan…so you can have a little, or a lot! Or how about a big sheet pan full of Chocolate and Cherries? This beauty was a Pillsbury Bake-Off Winner and tastes like it! This cake will make your next grown up party a hit! 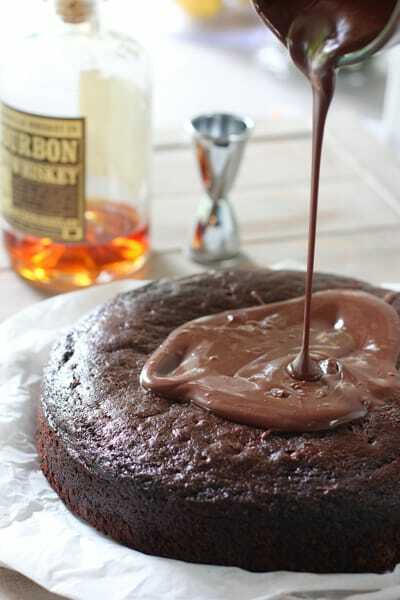 Filled with chocolate and a hint of bourbon taste. Super easy on the cook recipe! Spray a 10" spring form pan or a 9 x 13 baking pan with non stick spray. In large mixing bowl combine egg, sugar, sour cream, vegetable oil, and vanilla until well blended. Add cocoa powder, whiskey and coffee. Mix until no lumps are evident. Add flour, baking soda, baking powder and salt. Pour chocolate chips in large microwave save bowl and microwave for one minute until chips are just soft. In another microwave safe bowl, heat cream until it just begins to boil. About 2 minutes. Let sit for 2 minutes before stirring. Stir with whisk. Chocolate will melt and will become a creamy consistency. Spread over cake and sprinkle with chocolate pieces. I made this cake three times… added 1/4 cup more oil and 1/4 cup more coffee the second and third time and it was out more moist that the first time I made it. It has gotten rave reviews. Yummy and the spiked ganache is a perfect topping! Delicious. Thank you Pat! We are so glad you loved it, it is always a show stopper! Can you make it in to cupcakes????? Would be delicious sonnet! Will make 24-30 cupcakes, simply reduce the baking time to around 25 minutes. Same oven temp. Hope they are a hit! Love this recipe! Can it be made ahead of time and frozen? If so, I assume it would be better to put the ganache frosting on the cake after defrosting? Exactly! It’s very moist and should freeze really well! Hi, I’m going to try and make this for my husband’s birthday this weekend. We’re in the UK – what sort of sugar have you used? Thank you! Hi Claire – just plain old white granulated sugar! I updated the recipe card to make it easier to understand…thanks! Hi, can I use instant coffee instead of brewed? Thanks! You bet! Prepared with the water. What kind of flour did you use? Cake flour or all purpose flour? This is super delicious ! 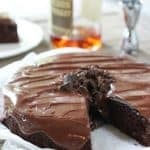 amazed at how well the whiskey and coffee worked in a chocolate cake, will definitely do again ! Wow. 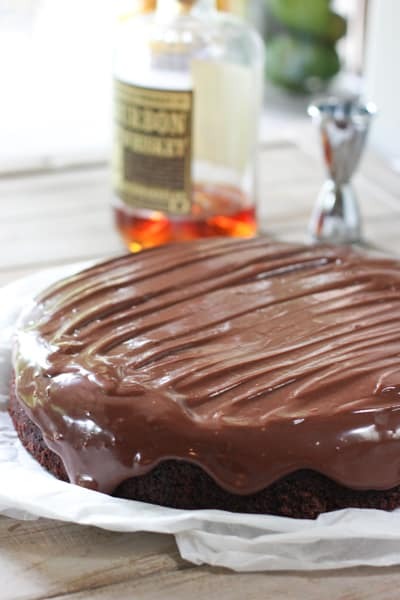 I made this cake using Jack Daniels… Yummy! I made small bundt cakes and cooked for 20 minutes and it is delicious! I am lactose intolerant so I used coconut cream for the ganache and it came out splendid!